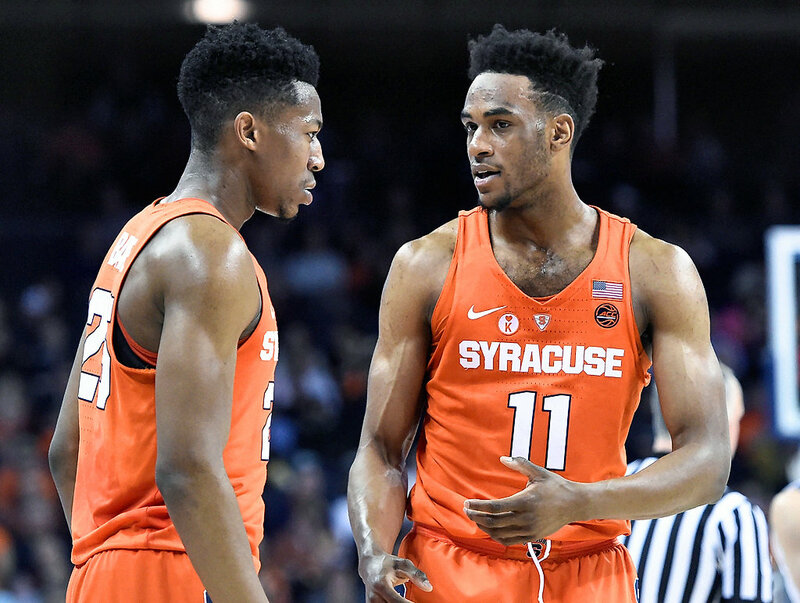 Tyus Battle’s return has significantly brightened the future for Syracuse in 2018-19. 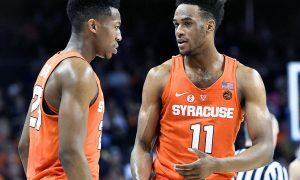 With the junior back in the fold, the Orange will not have an NBA draft pick for the first time since the 2011 Draft. What happened that following season? Only the winningest season in school history in both total wins (34) and winning percentage (.919 percent). However, the NCAA refuses to recognize it after stripping all 34 wins as a part of the program’s scandal from a couple years ago. So actually it is one of the losingest seasons in program history. Whatever. But in reality, this 34-3 squad returned a lot of key pieces that year which led to a successful run that featured two separate double digit winning streaks. 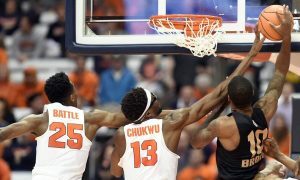 However, the team fell short of the ultimate prize after an Elite Eight loss to Ohio State, who ironically is the Orange’s ACC-Big Ten Challenge opponent this season. 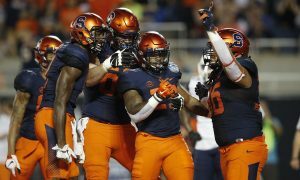 This all begs the question, is Syracuse a 30-plus win team with Battle back in central New York? First of all, a lot of good things have to happen for SU (or any team for that matter) to crack 30. But the Orange is set up for those good things to happen. 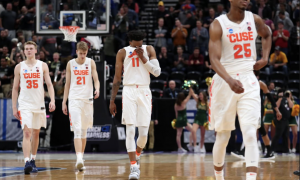 Syracuse returns all five starters from a team that made an improbable Sweet 16 run and nearly took down arguably the tournament’s most talented team in Duke. 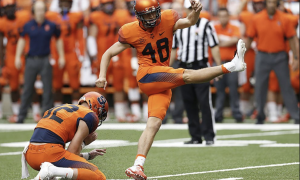 But along with an experienced returning core, the Orange also has plenty of talented newcomers. East Carolina transfer Elijah Hughes finally gets to see the floor after sitting out last year from transfer rules. He looks to bring a great scoring punch to the backcourt off the bench. As for the freshmen, Jalen Carey seems to have fans salivating. 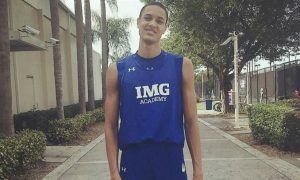 After Darius Bazley decommitted from the program in late March, Carey’s father, John, told The Fizz that the team’s sudden loss “just fueled Jalen Carey.” ESPN’s Paul Biancardi also dubbed Carey this year’s “Trae Young candidate” as the player who comes in relatively unheard of across the country, but will make a major impact. While Carey is the team’s prized possession, there’s a solid supporting cast in the Class of 2018. Buddy Boeheim is essentially a 15th year senior with four more years of eligibility. 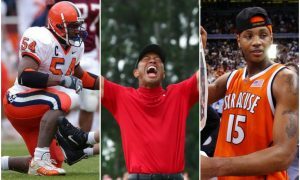 He knows Orange basketball better than anyone on the roster. In fact, I’ve heard he mastered how to play the 2-3 zone before he learned how to do long division. Kidding (but only kinda). And Robert Braswell is another solid late add. 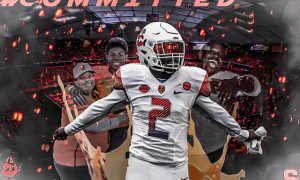 He’s a late bloomer who fits the Syracuse player mold and took advantage of the Orange losing out on a couple of recruits. He represents this year’s great unknown. 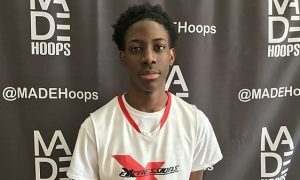 Like Marek Dolezaj last season, there isn’t a lot of intel on Braswell because of his past. Now when you look across the country at the past couple of seasons, only a small handful of teams actually win 30 games. About 9 or 10 teams have reached the mark each year over the last nine seasons. Looking at 2017-18 for reference, 10 teams were in the 30 win club. But that number can be semi-misleading. Three of those teams were mid-majors. Not to take anything away from the Loyola’s and Gonzaga’s of the world, but their conference schedules set them up nicely for 30 win seasons. In fact, the Zags have won 30-plus in four of the last six seasons. 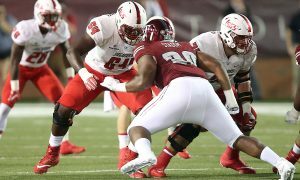 But when you’re a mid-major who is capable of competing at a Power Five level, conference play is essentially a walk-through. Teams can potentially rack up 20 or more wins, thanks to conference tournaments. The key to a 30 win season is no early exits in the conference tournament. 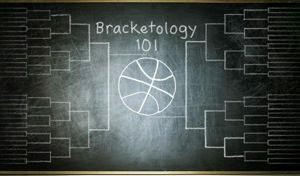 Seven of the 10 teams won their conference tournaments, while two of the other three teams lost to a 30 win team. A lengthy NCAA Tournament run certainly helps, but isn’t necessary if you dominate the regular season (see Cavaliers, Virginia). As for where these teams slot in the rankings, last season the lowest team to win 30 games was St. Mary’s who actually finished the year ranked below Syracuse in the receiving votes portion of the polls. But again, St. Mary’s is a mid-major whose only real competition during conference play is Gonzaga, albeit another 30-plus win team. A more reasonable bar is Cincinnati. The Bearcats ended the year at no. 12 in the country with 31-5 record. 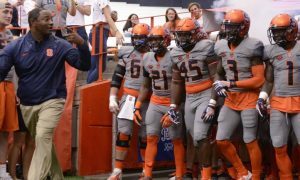 The Orange should enter the season as a top 20 team in the country, especially after last year’s run. 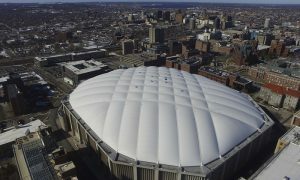 When you look at how Syracuse shapes up, there is certainly reason to be excited. 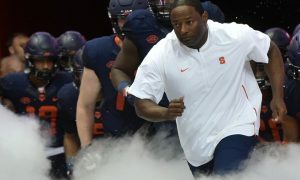 Every 30 win team had veteran leadership and talent, which is exactly what SU has with Battle returning alongside Oshae Brissett and Frank Howard to go along with the aforementioned talented newcomers. The difficulty here is the schedule. This factor is more important than talent or luck. Playing in the ACC makes this nearly impossible. In fact, Virginia was the first 30-plus win team in the conference since Duke did it in the 2010-11 campaign. 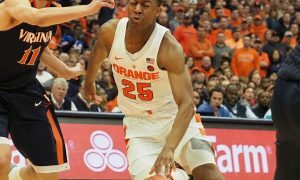 While Syracuse’s schedule is far from complete, the recent news that the Orange will face Ohio State in the ACC-Big Ten Challenge is certainly promising. The Buckeyes aren’t nearly the team they were last season. 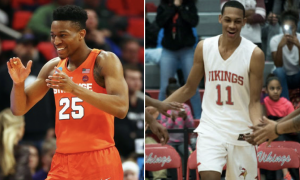 OSU took a huge hit by losing B1G Player of the Year, Keita Bates-Diop as well as key members Jae’sean Tate and Andrew Dakich. As for the other known or potential non-conference foes, the Orange could have its work cut out for it. 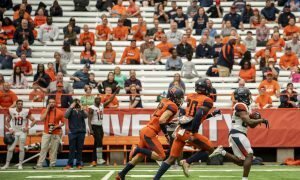 Syracuse hosts a fiesty Buffalo team for the second straight year. 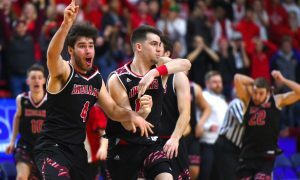 The Bulls are coming off a season where they upset Arizona, one of the most talented teams in the NCAA Tournament. 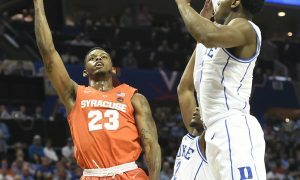 Along with that, SU could meet up with Oregon in the 2K Sports Classic. The Ducks own one of the nation’s top recruiting classes to go along with a strong returning bunch. 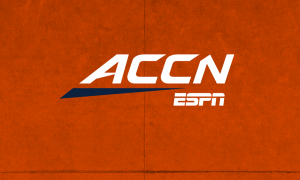 And all of that comes before what’s shaping up to be a tougher ACC schedule than usual. 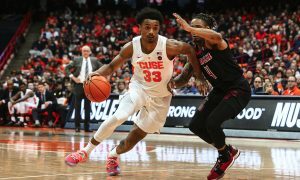 Of course, Syracuse faces every team in the conference at least once which is already a steep challenge in and of itself. 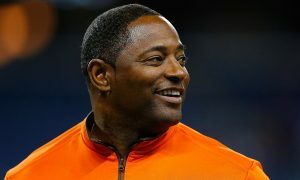 But the Orange is doubling up against some of the best teams in the league. 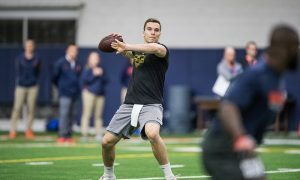 SU gets a home and home with the nation’s most talented team in Duke. Then on top of that, there’s an extra game with Clemson, which figures to be a top 25 team again. 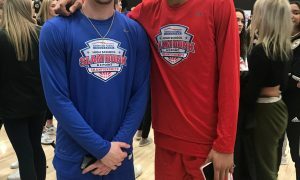 Boston College returns some of the best players in the conference in Ky Bowman and Jordan Chatman. And then there’s Pitt who is… well, still Pitt. There still isn’t anything good to say about the Panthers. I guess they have a new coach who’s from the Coach K tree. But that’s about it. Capitalizing on road games is the only way this team will eclipse 30 wins. The Orange travels to take on North Carolina, Virginia Tech and Notre Dame amongst others. That’s far from an easy slate. 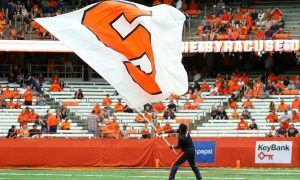 While it’s certainly possible, the schedule is going to be too tough for SU to get to 30 wins. Playing in the ACC is a weekly dogfight where you lose games you’re not supposed to and win games you’re not supposed to. But don’t be discouraged. 30 wins isn’t the lone indicator of a successful season or tournament success.